Did You Know That More Upholstery Gets Ruined From Improper Cleaning Attempts Than From Any Other Cause? It’s true. And it’s not just you, the home owner that causes it. Believe it or not, much of the damage is caused by service technicians who are supposed to be giving you professional upholstery cleaning service. “Why is this?”, you ask. Well, frankly, cleaning upholstery can be tricky. But when the right steps are taken and the right procedures are used, having your upholstery professionally cleaned can produce some tremendous results for you and your home. Quality professional upholstery cleaning can can improve the indoor air quality of your home, reduce allergens, and extend the life of your upholstery when done properly. However, a poorly trained technician can easily and quickly create permanent damage to your upholstered furniture. This is because upholstery fabrics vary widely in construction and in fiber content and weave. 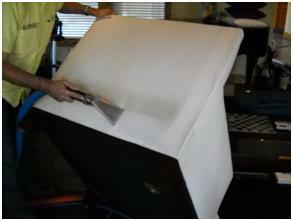 Understanding this is the first step in safe and effective professional upholstery cleaning. Incorporating the correct techniques and procedures will insure thorough cleaning and quick drying while eliminating the potential for bleeding, browning, shrinkage, fabric distortion and other common problems. Professional Upholstery Cleaning by Summit Cleaning Makes All the DifferenceCleaning Upholstery correctly requires significant knowledge and training. Most local carpet and upholstery cleaners are not certified (see www.iicrc.org). But we are. Summit Cleaning Services has both IICRC Certified Journeyman and Master Textile Cleaners with a combined 33 years experience in professional upholstery cleaning. We are the only company in Northern Nevada with such credentials and experience. You can rely on us. You can be confident that we have both the knowledge and the expertise to clean your upholstery right the first time and to give you the premium results you desire. Just ask one of our customers! Stephen did an amazing job on our carpets and furniture today. They look good as new. The sofa and recliner - he was able to get out the old stains! What Are the Correct Professional Upholstery Cleaning Procedures? Our service motto and mission is to make you smile by providing you with the best service experience ever. this is not just a clever saying, it's also our guarantee. Because we hold such a high standard of excellence, we make sure to use only the proper professional cleaning procedures for your upholstery and fabrics. Whether you have an antique cotton Jacquard wingback chair, or a modern micro-fiber sectional sofa, we can help keep it looking beautiful for years to come. Plus, all the upholstery we clean is treated with Maxim Advanced Stain and Soil Protector for ease of care. Upholstery is normally dry in less than one hour.